Innocenzo Pedretti was born in Brescia in 1934. He has been taking photographs since his early childhood as a self-taught photographer. He began to practice black and white pictures printing in 1960s and colour printing at the beginning of 1970s. 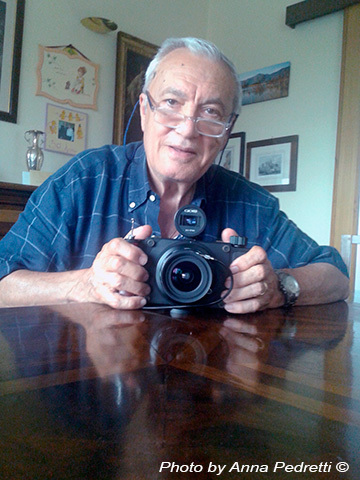 He entered the Brescia CINEFOTOCLUB and since 1974 he has taken part in various national and overseas competitions where he has obtained awards and acknowledgments. He has been using KODAK INFRARED film since 1990 and it is this one that would become his preferred emulsion. He attended the first Gubbio workshop kept by Frank Dituri and Daniele Fava and has always been there every year since then, first as trainer and afterwards as a tutor. Together with Daniele Fava and Frank Dituri he set up the prestigious ITALIAN INFRARED PHOTOGRAPHY ASSOCIATION in Gubbio. He holds lectures about infrared technique every year and always with great pleasure. He kept lessons even in the USA and carries forward a cooperation with the Fine Arts Department of the Long Island University in New York and with the Winston Salem State University in North Carolina. His writings have been published by prestigious magazines while Italianl and New York televisions have spoken about him. National and foreign newspapers – and among these the New York Times – wrote about him, as well. He took part to the New York Guggenheim Museum program LEARNING THROUGH ART (LTA) as Assistant Artist. He studied at the Brescia Fine Arts Academy where he graduated with a degree thesis on Artistic Photography. He was a teacher at the LABA – Libera Accademia di Belle Arti (Fine Arts Academy). He has always considered photography as a means to escape the strains resulting from his work and as an amusement. Among his publications: Il cuore di una città (The Heart of a City), Due Paesi (Two Countries), Camminando con la natura (Walking with Nature), Istantanee (Snapshots), Il sentiero dell’anno (The Path of the Year), Lo spazio… è… un volo! – X-Pan Vision (The space is a flight – X-Pan Vision) and numerous calendars. New York City,Tampere (Finland), Royal Academy of Tamines (Belgium), Memphis, Yonkers, New Jersey, and in Italy in the city of Brescia, Marghera, Gubbio, Costacciaro, Castellanza, San Felice del Benaco, Mogliano Veneto, Florence, Busto Arsizio and Venice.